With walking, you don’t have to do a lot to reap the rewards. The minimum recommendation from doctors to keep your body healthy and prevent illness such as heart disease, cancer and diabetes is 150 minutes of activity a week. So you could look at that as just 30 minutes a day, 5 days a week – and you can break that down into chunks of ten or fifteen minutes at a time if you like. 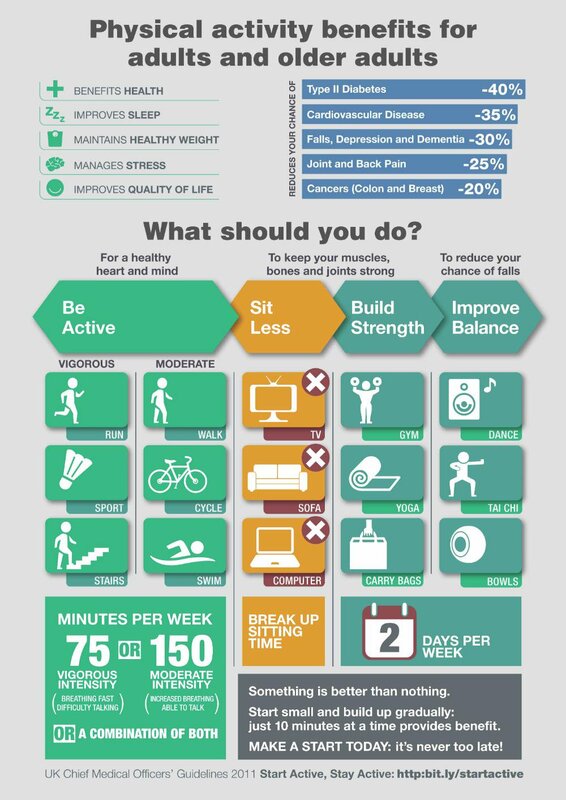 Public Health England have produced an infographic based on the UK Chief Medical Officers recommend levels of physical activity guidelines which you can find here. You don’t have to walk for a long time or at a brisk pace from day one. You can build up as you go. And it won’t be long before you start to see the benefits. "Walking for Health has helped me build up my fitness and lose weight – now I walk for enjoyment, not just around the supermarket"
Walking can help to keep your mind and your social life healthy too, so why not make a start and find a walk near you today. We're a friendly bunch and we'd love you to join us.